Rosy has an exhausting show circuit that runs virtually all year; their efforts have not gone unnoticed as she has been a consistent medal winner at RHS Flower Shows including 23 Gold medals at The Chelsea Flower Show making her the most successful female floral exhibitor. Also a Gold Medal Garden Designer at The Hampton Court Flower Show, picking up a Gold for their first ever garden at Hampton Court in 2001, getting the double in 2004 with a total of 4 Gold Medals and 3 Silver Gilt medals for her garden designs. She was also awarded a RHS Chelsea Silver medal for her Brewin Dolphin Forever Freefolk Garden 2016. Beautiful herbaceous borders and gardens are the inspiration for all of Rosy’s designs in which she has introduced many new varieties including Gaura Rosyjane, Gaura Freefolk Rosy, Gaura Ice Cool Rosy. Rosy is a member of the RHS Herbaceous committee and a RHS exhibit judge so is aware of the standards that the RHS expects. Rosy was immersed in plants and gardens from a very early age, taking inspiration from both her Mother and her Grandmother and ending up as a prize winning student at Writtle College. The current nursery at Whitchurch was set up in 1991. 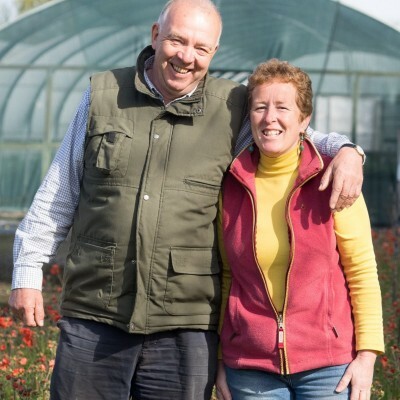 When not travelling the length and breadth of the UK to stage show stopping displays Rosy and Robert Hardy are busy growing at their nursery in Hampshire, hosting open days and fund raising for local hospice Naomi House. Rosy is always busy on the lecture circuit or diving exotic waters in her down time whilst winning consistent RHS gold medals makes the team more determined to not let standards slip and whilst Rosy’s competitive nature is part of what spurs her on to keep hitting gold medal standard, It is her love of what she does; breeding, growing and exhibiting that keeps her on her toes and at the top of her game.